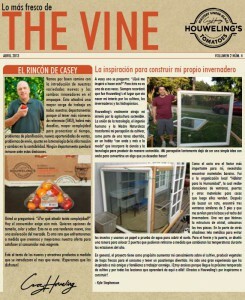 The April Vine is our second Online. This issue features some of our newest products and packaging for the coming season. With the freshness of spring we have already started harvesting our Signature Medley’s in Canada and the first Heirlooms are showing-up in California. It is an exciting time and certainly the energy that comes with Spring is resonating throughout the company. To access the English or Spanish versions, click the links or the pictures. 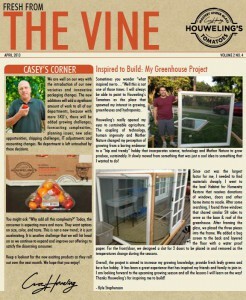 This entry was posted in Business, Culture, Greenhouse Grown, Mastery, Newsletter, Recipe, Sustainability, Tomatoes and tagged Green, Greenhouse, Growing, Recipes, Seed to Plate, seedling, Sustainability, Sustainable, Tomatoes, Vine-ripe. Bookmark the permalink. Comments are closed, but you can leave a trackback: Trackback URL.